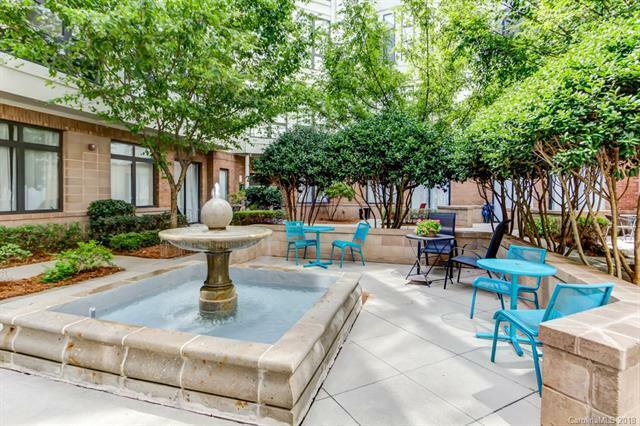 Charming and Spacious 1 BR, 1 Bath condo in the heart of Uptown Charlotte's First Ward! This is as close to the center city as you'll get for the price! Close to everything! Spectrum center, First Ward park and Lynx light rail are only steps away. This condo is located in a secure, gated building and comes with an assigned parking space. Rear of unit opens up to beautiful courtyard. Enjoy quiet mornings with coffee on the patio or read a book in the afternoons. Plus, Court 6 offers some of the lowest HOA dues in all of uptown. Seller willing to convey fridge, washer and dryer with the right price! Condo features high ceilings, granite counters, large master bath, computer niche workstation and shelves, laundry closet, spacious living area & studio, and tons of natural light w/ huge windows. Don't miss this chance to live in an amazing condo mere footsteps to everything uptown has to offer!